Live Where You Want… Invest Where It’s Best! Step inside the modern world of real estate investing. It was never within reach until now! So far, we’ve only discussed single markets – we started in San Diego and ended in San Diego; we started in D.C.; we ended in D.C. When we experienced a down cycle, we intentionally limited ourselves to ONE option – putting our money in the bank and waiting it out. 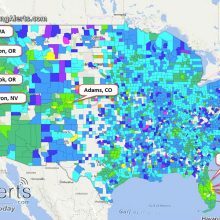 How powerful do you think these tools would be if, instead of ‘waiting it out,’ you used them to invest in other hot markets all over the U.S.? First, let’s see what you’d have if you invested that same $20,000 in an average market in the U.S. from 1980 to 2016 and just held it. Technically, you can’t actually invest in an ‘average’ market, but it’ll work for comparison purposes. 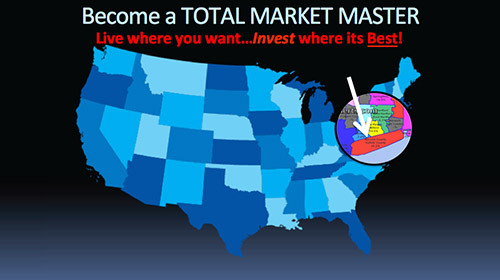 See the chart in the lower left corner of the ‘Become a Total Market Master’ (TMM) image? That shows the ups and downs of the U.S. overall market. Remember, real estate cycles are like three steps forward and two steps back; you make money then you give most of it back. You’d realize a TOTAL profit of only $25,225 during that entire 36 year period. 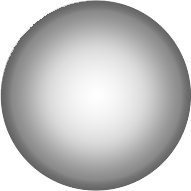 A 159% R.O.I. on your $20,000 investment. Now – Let’s hop off that train and do things like the big boys. 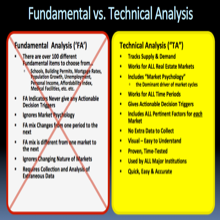 Let’s see what you would have made as a TMMer – a Total Market Master. 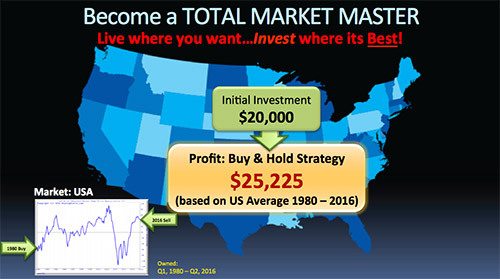 If you had lived where you wanted, and invested where it was best. Let’s follow the same model we started with. We check out our Single City Reports Tool, which tells us that Nassau Suffolk is about to catch on fire. 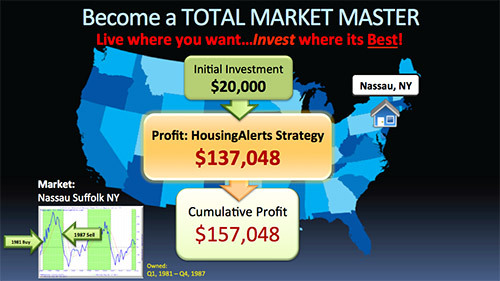 You invest that same $20K in a property in Nassau in 1981 and purchase at full retail price. You hold it – adding no additional value – letting Automatic Appreciation do its thing until 1987 when you get the signals to get out and you sell. 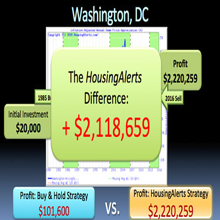 Your profit from that initial $20,000 down was $137,048, just from ‘Automatic Appreciation’! That’s right! In six short years, you reaped over $137,000! You also got back your initial $20K investment, so you have roughly $157K to re-invest again! 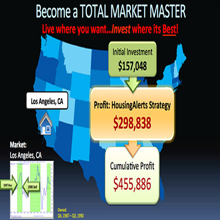 Wait until you see what happens when you take your profits and using Total Market Master data, put your money back into real estate at the right time. Want to see the Special Real Estate Market Report I just released that will leave your jaw hanging? Click Here Now.